The batter bowl is the perfect companion for measuring, adding, mixing and pouring ingredients for pancakes, muffins and cakes. The bright red measurement markings are easy to read even with thick batters and the soft grip cushions your hand while mixing and pouring. High side walls prevent splatter, even when using an electric mixer, and a wide lip and pour spout allow for easy, drip-free pouring. 6 in stock, can ship immediately. View more from Mixing Bowls, OXO Baking Tools. 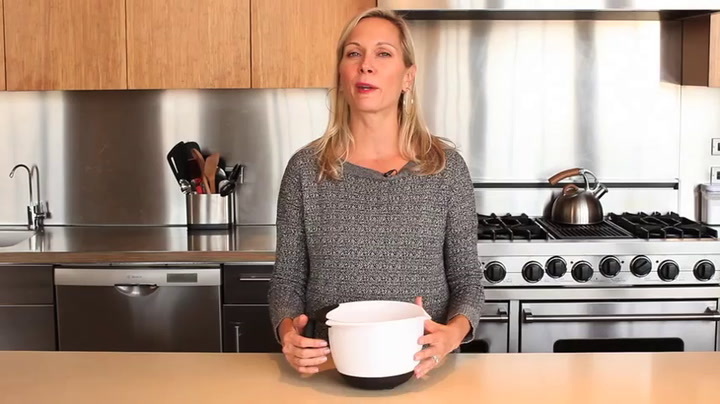 The bowl is slip-proof and a handy size for everyday baking. It is quite high which limits spattering. High quality indeed. I love the silicone base - it therefore doesn't slip whilst you mix. The measuring units are very useful to use. Although you can pour from it, it does tend to drip down the sides, but it is easier to pour from than a regular bowl. Good quality mixing bowl. Love the non-slip handle and base. At last a bowl that does not slip and slide around the counter. Would recommend to anyone tired of chasing their mixing bowl. Really like the non-slip, and the measurements on the side.